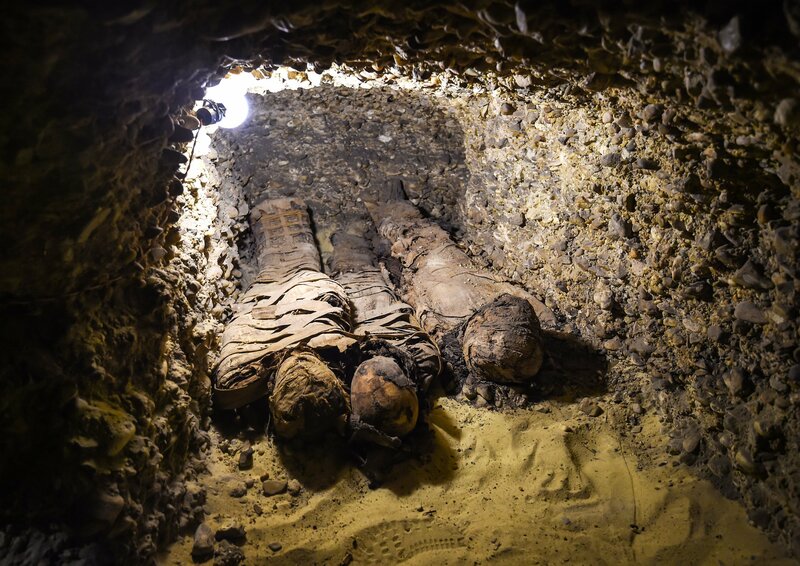 Egypt’s first archaeological finding of 2019 is a tomb containing 50 mummies from the Ptolemaic era (323-30 B.C.). 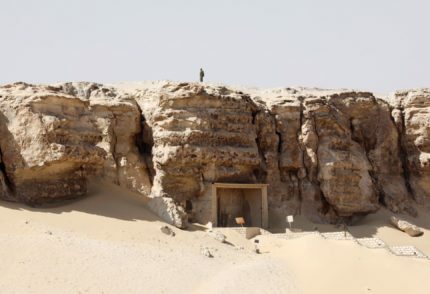 A joint mission of the Research Centre for Archaeological Studies of Minya University and the Ministry of Antiquities unearthed the tomb at the Tuna El-Gebel necropolis in Minya province, about 210 miles south of Cairo. 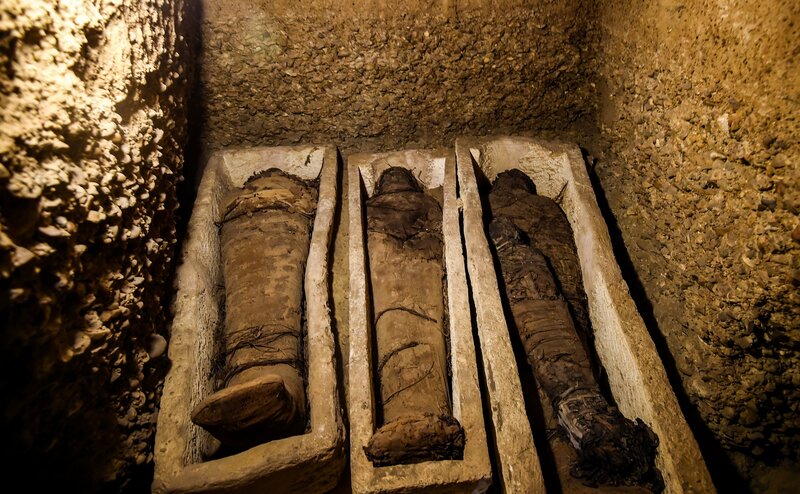 The mummies were found in a series of rock-cut burial chambers 30 feet deep. It’s believed to be a large family grave and the mummification methods suggest they were members of the upper middle class. They are of different ages (12 of them children) and genders and in a relatively good state of preservation. Some were wrapped in linen and buried in the sand or inside niches. 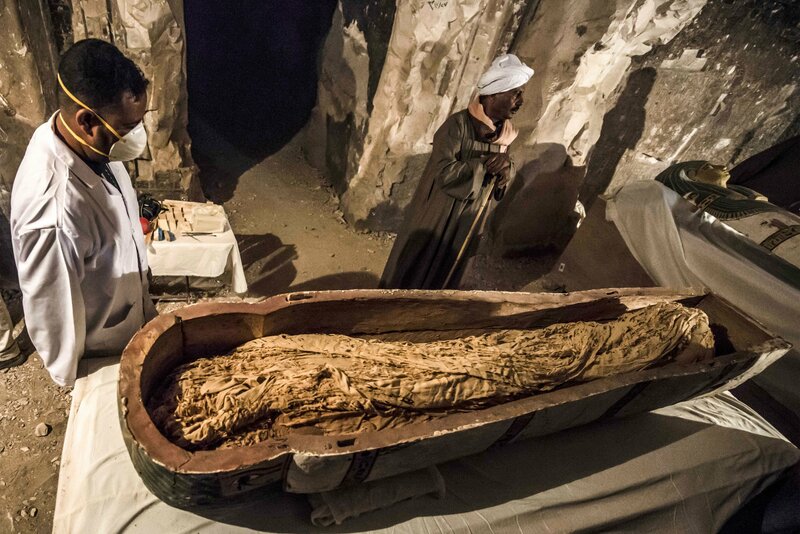 Others were placed in limestone coffins, still others in decorated wooden sarcophagi. 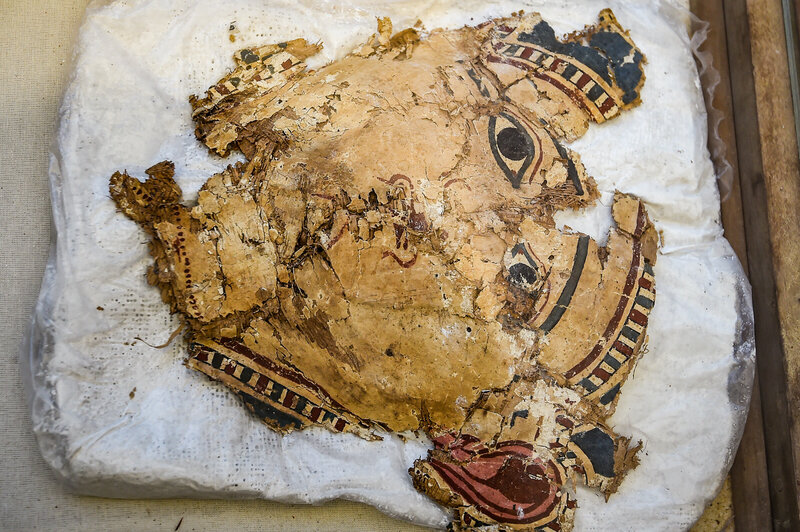 Only fragments of painted cartonnage that once covered several of mummified bodies were discovered. There are no names or hieroglyphic inscriptions in the tomb that might identify any of the deceased. Demotic handwriting was found on some of the linen wrappings; it has yet to be translated. The preliminary dating of the tombs to the Ptolemaic era comes from ostraca and papyrus fragments found in the tomb. That needs to be confirmed, however, as it’s also possible that some of the burials date to the early Roman period. While this is the most significant finding yet, the team began excavating at Tuna El-Gebel in February of 2018 and discovered a single rectangular chamber at the bottom of a sloping staircase containing multiple burials. On the west side was a chamber containing mummies and stone sarcophagi. On the north side was another burial chamber with stone sarcophagi placed in niches. These burials predated the most recent find. The style was typical of late New Kingdom and early New Intermediate Period tombs found at Tuna El-Gebel when it was the official necropolis of Upper Egypt’s 15th nome.